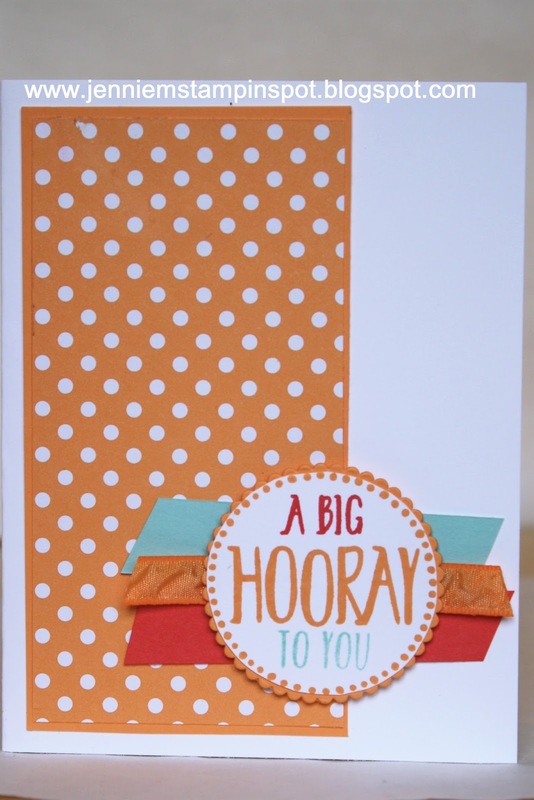 I used the retiring Endless Birthday Wishes with some retiring Party Animal DSP for this card. 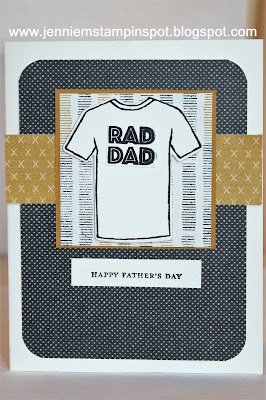 I also used the sketch at Hand Stamped Sentiments#265 here. 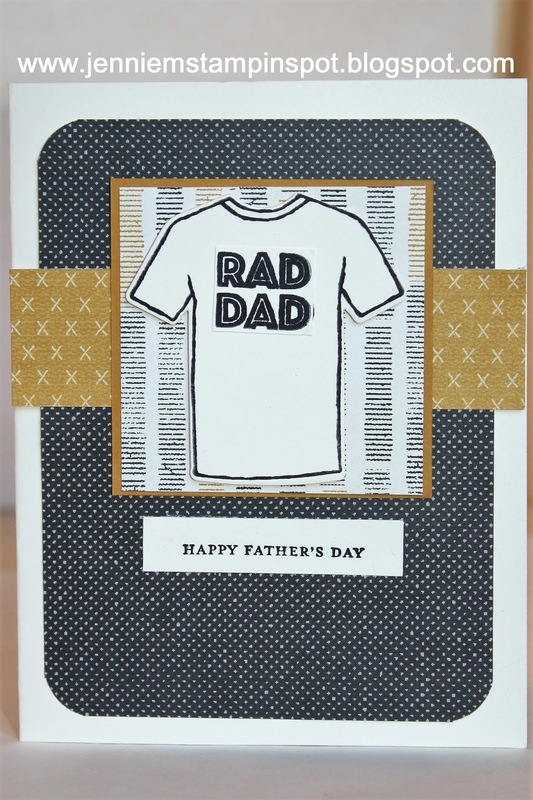 A double duty Father's Day card. First, I used the sketch at The Paper Players #346 here. And second the SUO Challenge#175, Mainly Masculine, here. Custom Tee is the stamp set with some Urban Underground Specialty DSP, both to retire! I also used Teeny Tiny Wishes for the greeting. 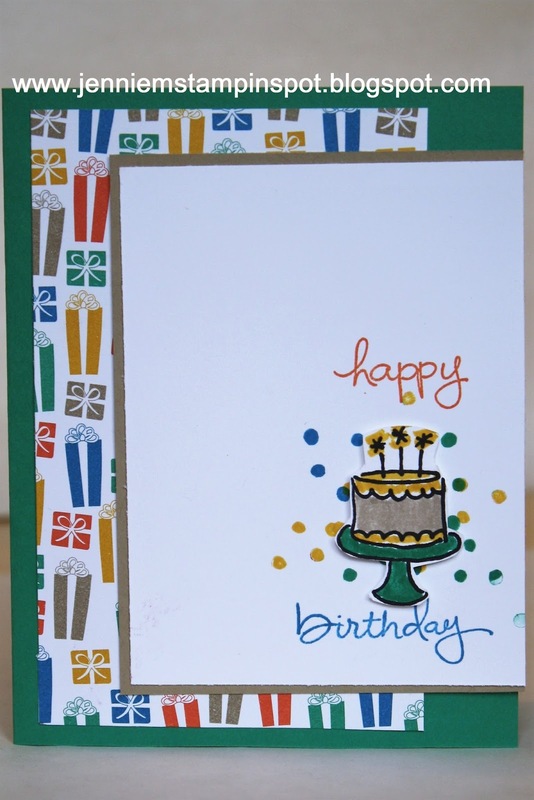 This card uses Case this Sketch#223 here. 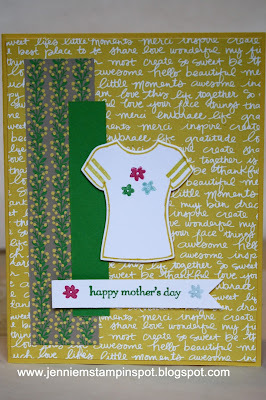 Custom Tee and Suite Sentiments are the stamp sets with some Brights DSP Stack. 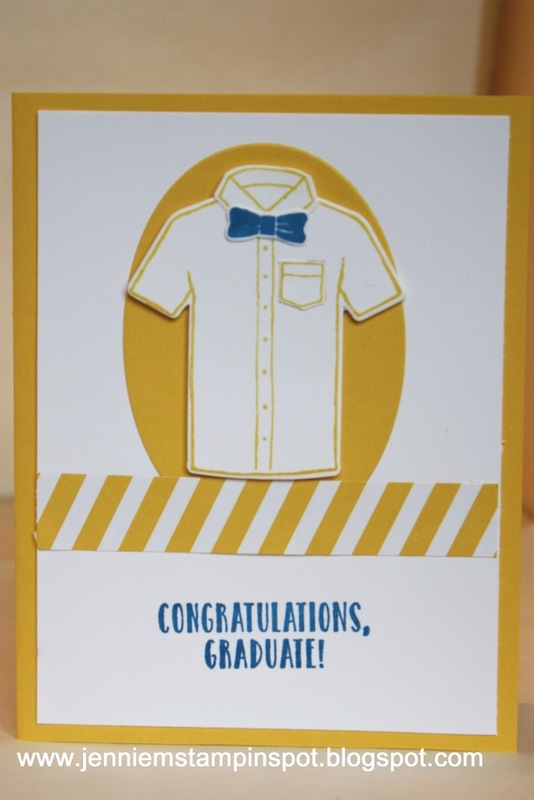 A graduation card for a sketch and a color challenge. First, the sketch from MojoMonday#498 here. 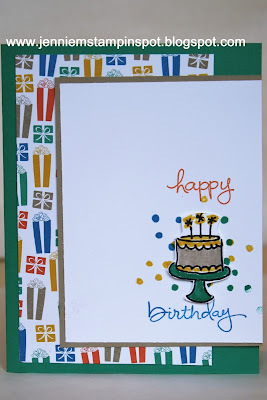 And second, the colors from Hand Stamped Sentiments#264 here. The colors to use are Peekaboo Peach, Watermelon Wonder and Pool Party. Perfectly Wrapped is the stamp set (which is retiring and I'm really gonna miss!) with some 2016-2018 In Color DSP Stack, also retiring. 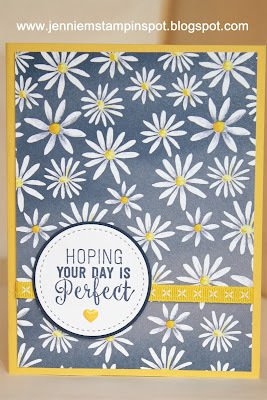 This card uses the Case this Sketch#221 here. 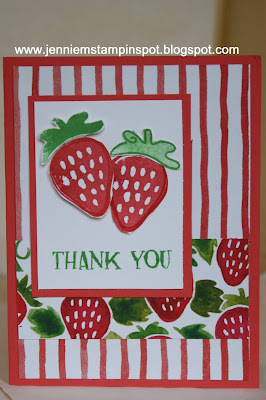 Both the stamp set, Fresh Fruit, and the DSP, Fruit Stand DSP, are retiring. And so is the In Color, Watermelon Wonder. WHEW! What a weekend! My oldest daughter graduated from the University of Wisconsin-Madison, the middle daughter finished her junior year at UW-Oshkosh and our son had his Senior Prom! And the graduate left for Europe today! 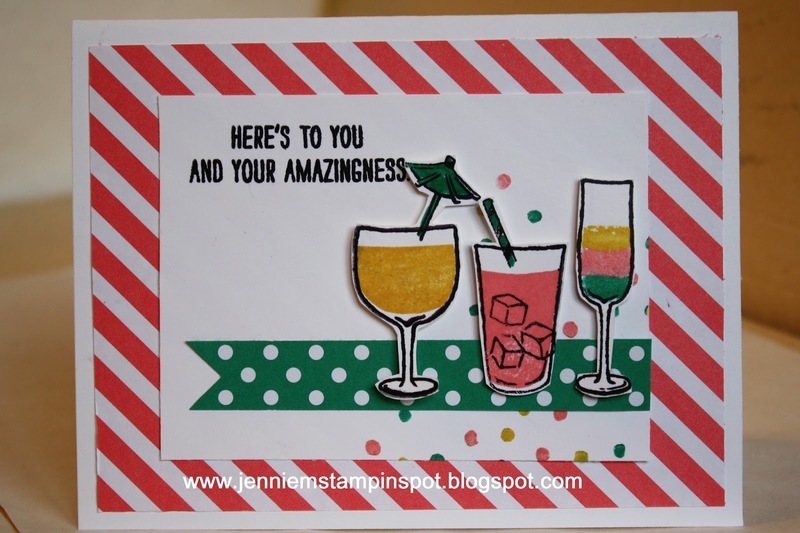 Lots of wonderful celebrations kept me from stamping but that's life, and one I'm so very thankful for! 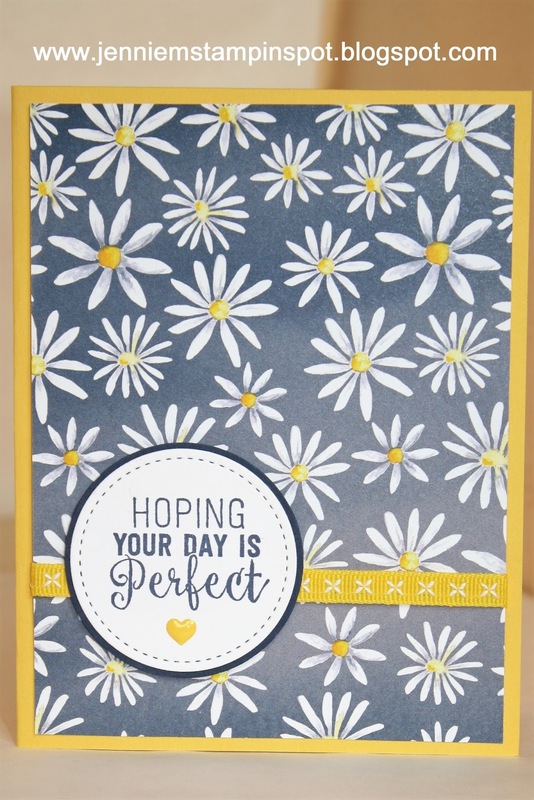 So I finally got to play today with some new DSP, Delightful Daisy and new ribbon, 1/4 inch Daffodil Delight double-stitched ribbon. 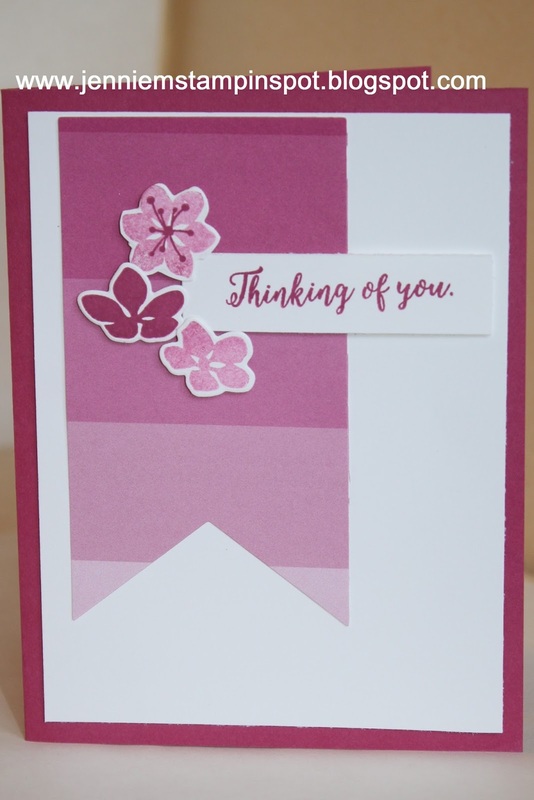 Paired that with a stamp from Suite Sentiments and a Brights Enamel Shape. I also used the Freshly Made Sketch#288 here. 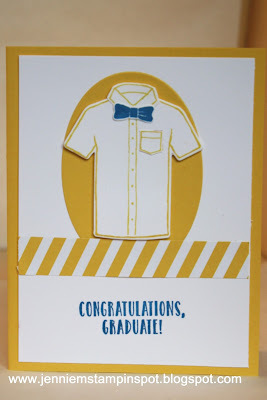 I need a graduation/ going away card for a sweet college grad and I thought the Mixed Drinks stamp set would be perfect! This card also qualifies for two challenges. First, the color challenge at TGIF#106 here, to use Crushed Curry, Flirty Flamingo and Emerald Envy. 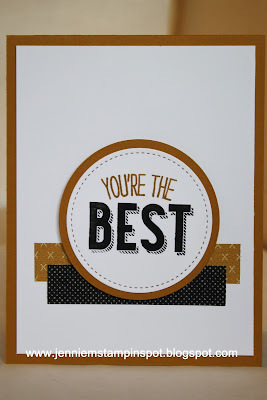 And second, the Hand Stamped Sentiments Inspiration Challenge#263 here. I was inspired by the colorful, fruity drinks picture. 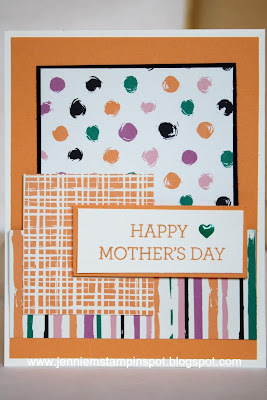 This card uses new catalog goodies and the Freshly Made Sketches#287 here. 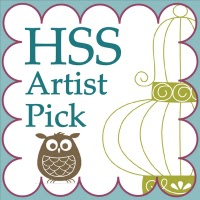 Colorful Seasons is the stamp set with some beautiful Color Theory DSP Stack. New Catalog Sneak Peek Goodies! My 2017-2018 New Catalog pre-order arrived today and I had to play! I used the new 2017-2019 In Colors and did some water coloring. The new In Colors are Powder Pink, Berry Burst, Fresh Fig, Tranquil Tide and Lemon Lime Twist(in order of appearance). I also used a new stamp set, Colorful Seasons, and the coordinating Thinlit, Seasonal Layers Thinlits, for the flower. And there's some new ribbon, Tranquil Tide and Lemon Lime Twist 1/2 inch Finely Woven Ribbon. Finally, this card uses two challenges. 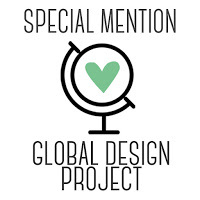 First, the sketch at the Global Design Project#086 here. And second, the SUO Challenge#174 - Water coloring, here. Can't wait to play with more goodies! This card came together in a snap thanks to the Mojo Monday Sketch#496 here. 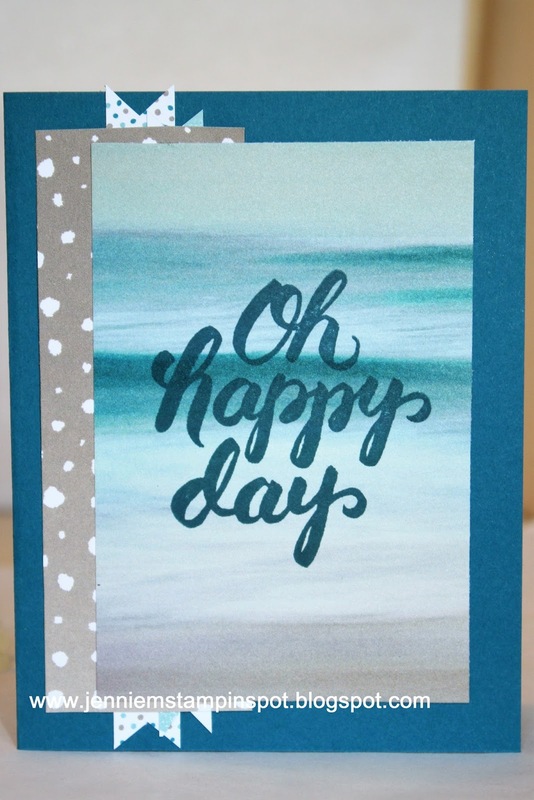 Scenic Sayings is the stamp set with some Serene Scenery DSP Stack, both to retire. I'm going to need some masculine thank you's so I used the Freshly Made Sketch#286 here for this card. 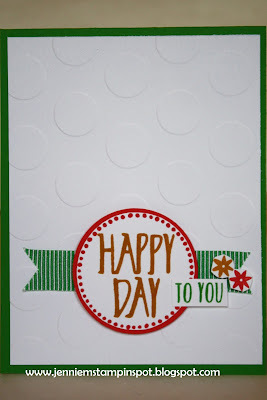 Friendly Wishes is the stamp set with some Urban Underground Specialty DSP, both retiring. 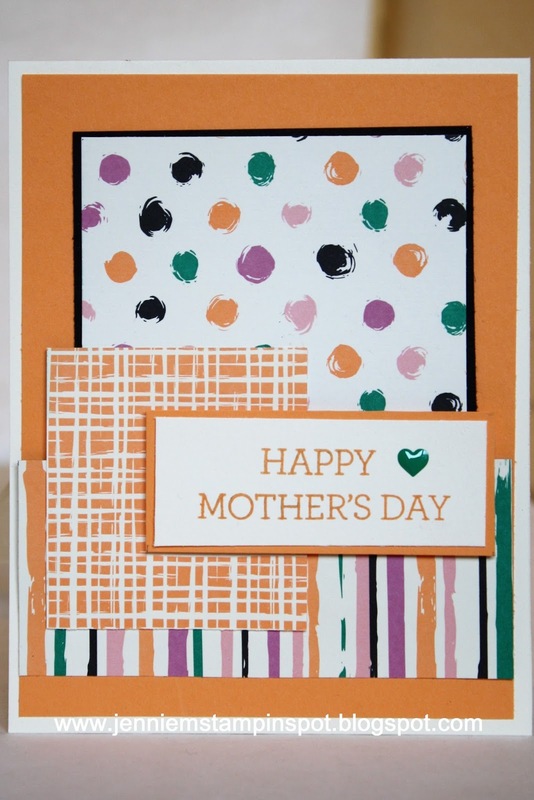 Here's a bright Mother's Day card for two challenges. 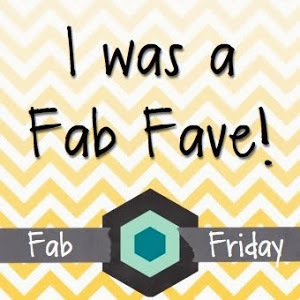 First, the sketch at FabFriday#111 here. 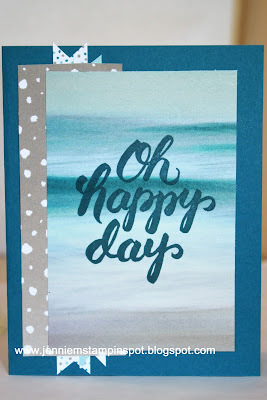 And second the colors are for the Splitcoast Color Challenge#633 here. The colors to use are Daffodil Delight, Cucumber Crush, Melon Mambo and Pool Party. Custom Tee and Teeny Tiny Wishes are the stamp sets with some Affectionately Yours Specialty DSP and some Brights DSP Stack. 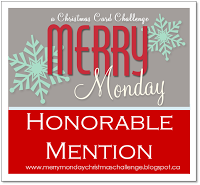 This card uses MojoMonday#495 here. 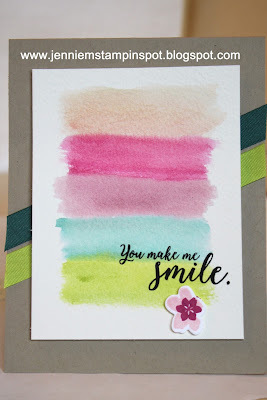 Crazy About You is the stamp set with some Playful Palette DSP Stack, both which will be retiring. I also added a 2016-2018 In Color Enamel Shape, also retiring. 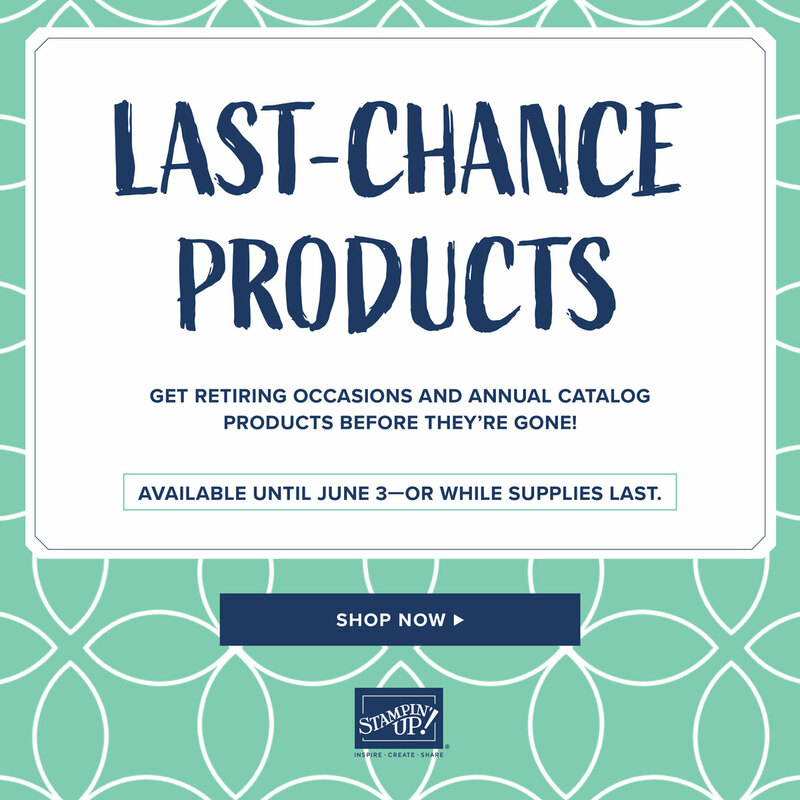 Only one month left before the new SU Catalog! Everything on this card, except the WW cardstock of course, will retire the end of this month. I used two challenges on this card. 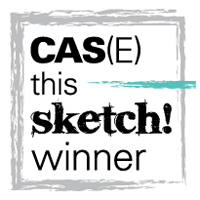 First, the sketch at Case this Sketch#219 here. 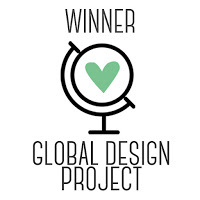 And second, Global Design Project#085 here - a color challenge to use three of the 2015-2017 In Colors. 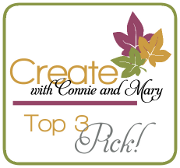 I chose Cucumber Crush, Watermelon Wonder and Delightful Dijon. 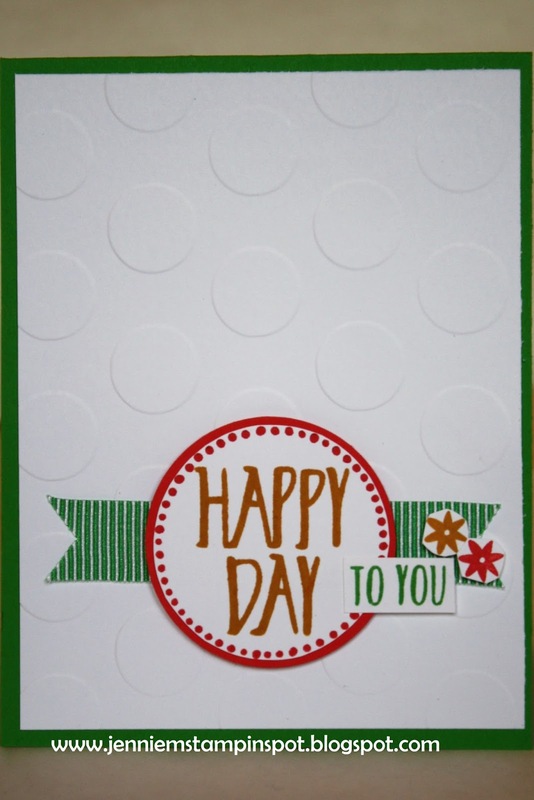 Perfectly Wrapped is the stamp set with some 5/8 inch mini stripe Cucumber Crush ribbon. 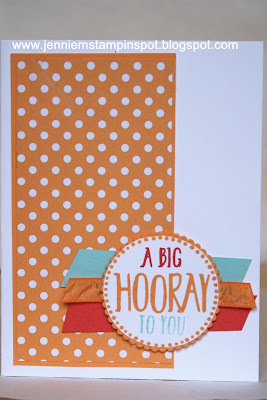 And I ran the WW thru the Big Shot with the Large Polka Dot embossing folder.